I've been couponing like crazy lately. It's a great way for me to contribute to the household while still staying at home. Recently I got a great deal combining coupons with a store promotion for Glade candles in the new autumn scents! I love the Rich Pumpkin Dream and Spiced Apple Magic ones! I stocked up big time, because I love to have one lit beside me as I begin my day. It calms me and when I'm calm I'm more productive. Needless to say, however, I've ended up with a growing number of empty candle holders. I hated the thought of throwing them out, so I researched options for re-using them. Step One -- place the candle, with its waxy residue in the fridge for about an hour. This will help you to lift the pool of excess wax from the bottom. Step Two - Remove the wick holder from the bottom at this point. If it doesn't allow itself to be removed easily, then place the glass in boiling water. It should remove nicely. Step Three - To remove any waxy residue that makes the glass cloudy, use homemade GooGone. The recipe is below. Apply liberally to the inside of the glass and rub with a cloth or paper towel to remove the wax film. 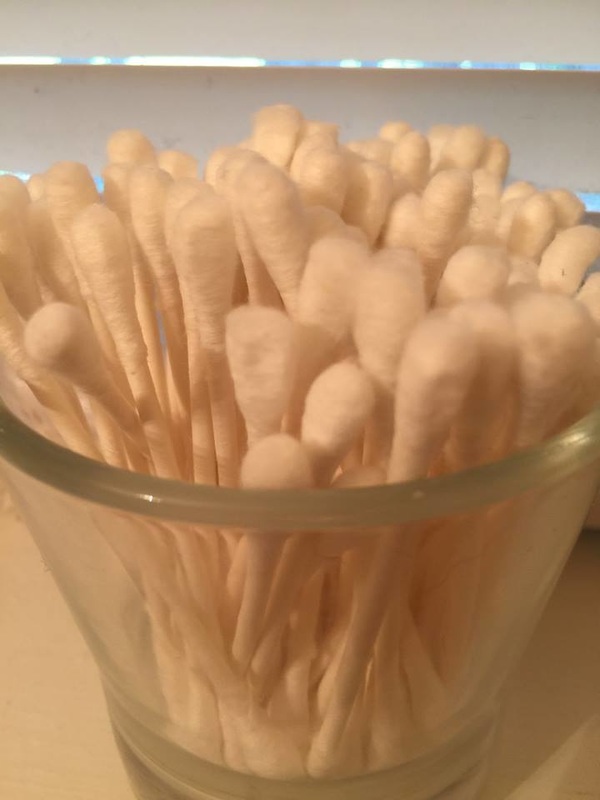 I used my first jar to house cotton swabs in our bathroom. It works perfectly. They would work perfectly in the kitchen as salt and pepper bowls, containers for sauces and condiments or even for prep work containers when cooking or baking. I've created a Pinterest board with even more ideas! Like my Granny said -- waste not, want not. Combine until smooth and store in a covered jar in your cupboard to use when needed. Great for removing labels from jars.